Top Used Four Wheeler Models - What Are the Best 4 Wheel Drive Utility ATVs? Top Used Four Wheeler Models! Which 4wd ATVs are Best Buys? We know a lot of you are looking for a good used four wheeler. Specifically, a 4 wheel drive utility type ATV. The big question is which ones are good bets, and which ones are trouble? Seems like everyone has an opinion, but who do you believe? So it was time to separate fact from opinion. Apply a little science to get to the truth. Filtering thousands of owner surveys for the answers you need was the best way to accomplish that. The surveys asked owners to rate their used four wheelers in each of four categories: Performance - Reliability - Quality - Comfort. They were then asked for comments on likes and dislikes for each model. Only used four wheeler models with enough survey responses to be statistically relevant were included. 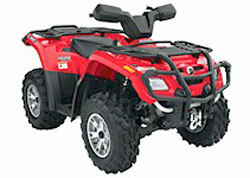 Top Rated Used Four Wheeler Utility Models. 2005 500 4x4 - Liquid cooled engine, front diff. lock, independent rear suspension, hi-lo range 5 speed transmission. These tend to be bargain priced on the used four wheeler market, and with all the features, that's a lot of bang for your buck! 2006 Arctic Cat 700 EFI 4x4 SE - 695cc liquid cooled and fuel injected single cylinder engine, 4 wheel independent suspension with 10 inches of travel, 1,050 pound towing capacity. A real work horse ATV that can still be fun for anything less than frantic trail riding. 2006 Outlander 800 HO XT - V-twin liquid cooled and fuel injected engine, 4 wheel independent suspension. XT includes winch, heavy duty suspension, and radial tires. One of the fastest 4x4 utility ATVs. 2006 Can-Am Outlander 650 H.O. EFI XT - V-twin engine with liquid cooling and fuel injection, double a-arm front and independent rear suspension with 9 inches of travel, XT includes a winch and radial tires along with heavy duty bumpers. 2007 Can-Am Outlander 400 H.O. XT - 400cc liquid cooled single cylinder 4 stroke engine, 4 wheel independent suspension, disc brakes front and rear, dual range CVT transmission, and variable locking front diff. 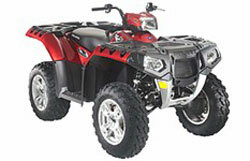 Great mid-size sport/utility ATV chock full of features. 2003 Four Trax Rancher 4x4 ES TRX 350 FE - longitudinally mounted air cooled engine, 5 speed tran. with electric shifting, torque sensing front diff. 2003 Four Trax Rubicon - longitudinally mounted 499cc liquid cooled engine, sealed automatic transmission, torque sensing front diff. 2004 Four Trax Foreman ES TRX 450 FE - 433cc, Air Cooled, longitudinally mounted engine, 5 speed tran. w/electric shifting, torque sensing front diff. 2007 Four Trax Rancher 4x4 TRX 420 FM - 420cc liquid cooled and fuel injected engine, 5 speed manual shift with automatic clutch. 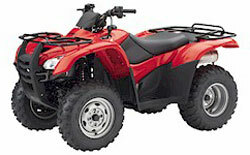 One of Honda's best selling models and a great choice as a used four wheeler. 2007 Honda FourTrax Foreman 4x4 ES (TRX500FE) - 475cc air cooled one cylinder engine, 5 speed trans. with push button electric shifting, swingarm rear suspension. Basic, simple, and tough. 2008 Honda FourTrax Rancher 4x4 (TRX420FM) - Electronic fuel injection, liquid cooling, single cylinder engine, 5 speed transmission, swingarm rear suspension. Solid and reliable with enough features to keep most folks happy. 2009 Honda FourTrax Rancher AT Power Steering (TRX420FPA) - longitudinal mounted single cylinder engine with fuel injection and liquid cooling. Independent suspension at both front and rear, five speed transmission with automatic clutch and electric shifting. This one is turning into an owner's favorite since Honda added independent rear suspension and power steering to the already popular Rancher 420. 2007 Kawasaki Brute Force 650 4x4i - V-twin SOHC 4-valve with liquid cooling, independent 4 wheel suspension, dual range CVT transmission. You would think the 750 would have been the highest rated Brute Force, but this is the one the owner's love. 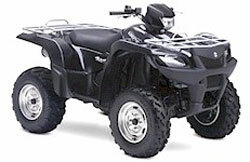 This model was introduced in 2007 and quickly became one of the top selling Kawasaki ATVs. 2004 Sportsman 500 HO - Same engine as 2001, long travel independent suspension, highest ground clearance in class, improved engine braking system. 2006 Sportsman X2 - 499cc engine, electronic fuel injection, longer wheelbase to accommodate a passenger. A favorite used Polaris ATV. 2008 Polaris Sportsman 700 EFI X2 - Vertical twin cylinder engine with liquid cooling and EFI, McPherson strut front suspension with independent rear, 400 pound capacity rear rack, and a whopping 1,500 pound towing capacity. 2009 Polaris Sportsman XP 550 EFI - First year of this new model. New 550cc single cylinder liquid cooled engine with electric fuel injection. Longitudinal mounting position like the Hondas. Independent front and rear suspension with 10.25 inches of travel, huge 1,500 pound rating for towing. Amazing for a 500 class ATV! 2003 Vinson 500 4x4 - 493cc liquid cooled engine, hi/lo range CVT transmission, locking front differential, sport/utility style. 2006 - 2007 Eiger 400 4x4 Automatic - Simple air cooled engine, locking front diff, dual range CVT transmission. 2007 King Quad 450 4x4 - Full size utility ATV with a mid-displacement liquid cooled and fuel injected engine, locking front diff, independent 4 wheel suspension, and disc brakes. 2008 Suzuki KingQuad 750AXi 4x4 - Big liquid cooled and fuel injected single cylinder engine, CVT transmission with hi/lo range and diff lock, all independent suspension front and rear. Good choice for a full size sport/utility ATV. 2003 Kodiak 450 4x4 Automatic - Mid-size sport/utility with the same driveline as the Grizzly 660, liquid cooled engine, disc brakes. 2004 Kodiak 450 4x4 Automatic - Same as the 2003 and one of the highest rated mid-size sport/utility 4x4 ATVs ever. 2005 Big Bear 400 4x4 - Basic 4x4 with air cooled engine, 5 speed tran, locking diff, and standard trailer hitch. 2006 Wolverine 450 4x4 - 4x4 sport quad with a little utility, liquid cooled engine, the good Yamaha automatic transmission, locking front diff, 100 pounds lighter than most utility 4x4 ATVs. 2006 Kodiak 450 4x4 Auto. - mid-size 4x4 with 4 wheel independent suspension, liquid cooled engine, good automatic trans, locking diff, almost 11 inches of ground clearance. 2006 Bruin 350 4x4 - smaller and more nimble 4x4 ATV, 348cc air cooled engine mated to the great Ultramatic transmission, locking front diff, good beginners 4x4 utility ATV. 2007 Grizzly 660 - One of the best all around 4x4 ATVs. Good at both sport and utility riding. Liquid cooled engine, 4 wheel independent suspension, Ultramatic trans, and disc brakes. Owners love 'em. 2008 Yamaha Grizzly 700 FI Auto. 4x4 EPS - All the good Grizzly stuff with a bigger engine and electric power steering. An absolute rider favorite! Fuel injection and power steering make the big Grizzly even more fun to ride. 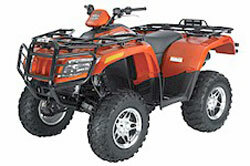 One of the best sport oriented utility ATVs around. 2008 Yamaha Big Bear 400 IRS 4X4 - Mid-size sport utility with simple air cooled single cylinder engine, 5 speed transmission with front and rear wheel engine braking, independent front and rear suspension, Yamaha's excellent 4 wheel drive system. Top Used Four Wheeler Models - Conclusion. Keep in mind that these are the absolute best of the best used four wheeler models. Only those with near perfect scores were included. Also remember that these surveys put a premium on overall owner satisfaction and not just reliability. It's obvious that Yamaha dominated the results. Honda was long thought to have the edge in reliability, but when overall satisfaction was considered, the Yamaha ATVs came out on top. Kawasaki finally put one of their models, the Brute Force 650, on the list. After all the surveys processed, we feel comfortable recommending any of the ATVs on our list. For those looking for the very best used four wheeler sport/utility 4 wheel drive models - this list should be a great starting point. 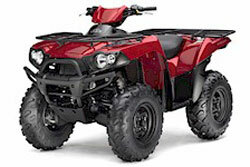 Buyers's Guide to Used ATVs For Sale. 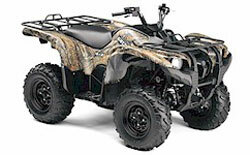 Best Used Sport and Utility Quads for Sale.